ADELLA M. HALL, WHO DIED IN 1870. There was a community here called Wilmeth named after one of the earliest settlers in the area, J. B. Wilmeth. The cemetery was started by John R. Jones in 1851 with the burial of an infant son. The cemetery was once called the Jones Cemetery. John Jones is the step father-in-law of R. A. McLarry, who was a county tax assessor. The name was changed to McLarry when R. A. McLarry sold the land, setting aside 2 acres of land for the cemetery with the deed recorded in Vol 198, p 345. Buried here are Polly McGarrah, the wife of John McGarrah, who started the town of Buckner, and Cynthia Ann Hunn, born May 5, 1845, who some say is said to be the first white girl born in Collin County. This cemetery is one of the oldest ones in the area. Many of the old graves are unmarked. It is said that there are over 200 graves with markers for less than 100. Thirty to forty Negroes are buried in the back. In recent years remains from previous burials have been found when digging new graves. The cemetery is active with the remaining space reserved for family and friends. The cemetery is fenced and the gate is kept locked. A historical marker is inside the fence. The cemetery is well cared for. In the study and writing of history there is one infallible landmark usually passed over by historical authors. This is our older cemeteries, or graveyards, as they were called up to fifty years ago. In them lie the pioneers who made the country what it is. Many, all too many, lie there with only the tombstone to note their passing; the part they played and the history they made having been long forgotten. It is the intention of this writer to note, from time to time, some of these old cemeteries and, so far as possible, the histories of our forefathers and mothers who lie there in eternal sleep. If somebody does not do so, in the immediate future most of them will pass beyond the memory of those now living, and their names lost from the world forever. Many of them deserve that this be not so. 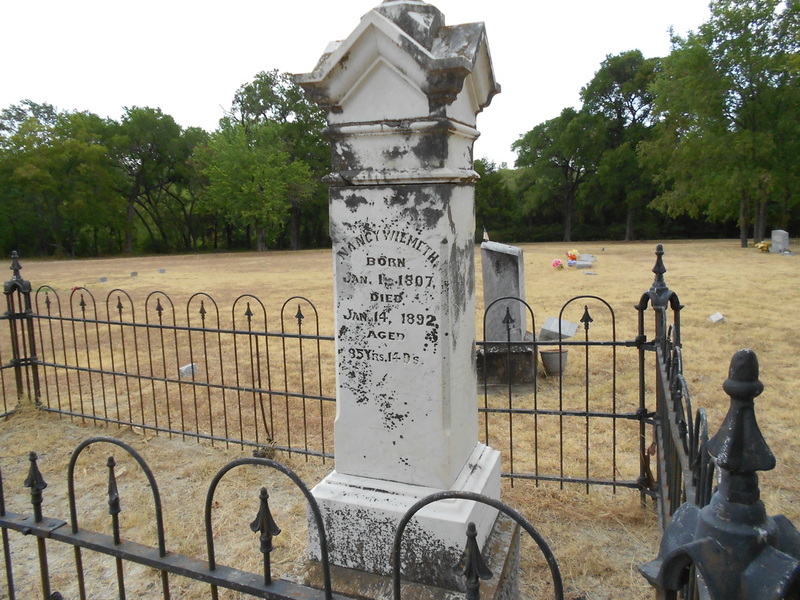 One of the oldest graveyards in Collin County is the McLarry Cemetery four miles north of McKinney in the old Wilmeth settlement. This burial ground was started in 1851 when John R. Jones, who owned the headright, buried an infant son there. Several early settlers were also buried in the cemetery, which was, at time, a private one. None of these are marked, the earliest stone with a date is that of Mrs. Eliza A. Jones, wife of J. W. Jones who died in 1887. 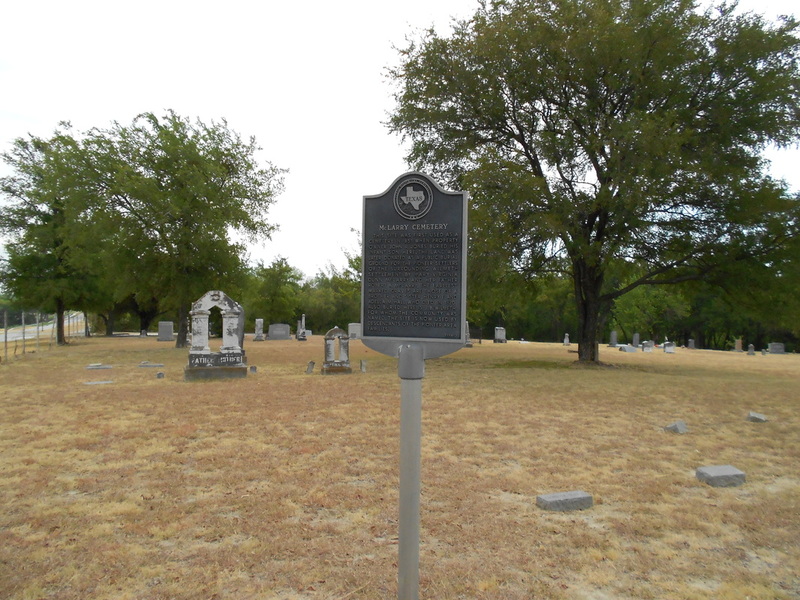 In this graveyard lie the remains of Polly McGarrah, wife of John McGarrah, the founder of old Buckner, the first county seat of Collin County. John McGarrah, or Jack, as he was called, went to California in 1849 and died in Panama on the way back. With him went Tola Dunn his son-in-law, who was born within a quarter mile of the present cemetery. Tola also failed to return. Both men left several children. Many of the McGarrah family lie here. Several Confederate veterans rest in this burial ground. Francis M. Hunn and R. A. McLarry are two of them. Uncle Frank Hunn was born in Kentucky in l838, and came to Collin in 1844 with his father. He served in the Civil War first in Johnsons Spy Company from McKinney, then in Patton's regiment and finally was under the great Confederate leader, Gen. John Morgan. Frank Hunn married Cynthia Ann Dunn, daughter of Tola, in 1868, and had 13 children. He died in McKinney, April 1, 1933. R. A. (Bob) McLarry was also in Morgan's cavalry, Company I, Duke's Kentucky Cavalry, and was with the Confederate general when he made his famous raid into Kentucky, Indiana and Ohio in July, 1863, with 4,000 men. A comrade of Frank Hunn's in the war, he came to Collin County in 1869 and married Hunn's wife's sister, Mary Virginia (Jennie) Dunn, in 1872. Aunt Jennie died in 1901, and lies in the cemetery which by now was known as the McLarry graveyard. Bob McLarry had bought land adjoining Hunn's on the north, and the cemetery was now on his farm. R. A. McLarry died in McKinney, April 5, 1929. Cynthia Ann Hunn, Francis M. Hunns wife, was born May 5, 1845 in a log cabin which stood in McLarry's field, within a half mile of her home after she married, and 400 yards of her final resting place in the McLarry cemetery. She, so far as known, was the first white baby girl born in what is now Collin County. Many of her children lie in the cemetery with her. Here, in a single grave, lie the pioneers of the Wilmeth settlement, Joseph Brice and Nancy Ferguson Wilmeth. They were both born in the same year, 1807, and both died in the same year, 1892, the same ago, 84 plus. Mrs. Wilmeth died on January 14, 1892, and Mr. Wilmeth the next day, and both were buried in the same grave. The Wilmeths came to Texas early 1845, to Dallas, and to their permanent home two miles north of present McKinney in early 1846. He was district clerk at old Buckner, helped locate and survey the town of McKinney and served in various capacities in the new County of Collin; Chief Justice (County Judge), and several other offices. His wife was Nancy Ferguson, a granddaughter of Gen. Patrick Ferguson, who was defeated and killed while leading the British forces against the Americans at Kings Mountain during the American Revolution of 1776. Wilmeth settlement took its name from them. Here too, lies Daniel Leak and his wife, Martha Marilia McKinney. D. L. (Leak) McKinney was a grandson of Collin McKinney, and Martha was a daughter of J. B. Wilmeth mentioned above. Mr. McKinney was born in 1827 and died in 1906. Aunt Martha, as she was called, was born in 1831, and died in 1930 at Van Alstyne, age 99. They had lived since their marriage, in 1850, in and near Van Alstyne, but moved to the old Wilmeth homestead in 1893. R. J. Straughan and his wife, Mary, are buried here. R. J. (Romey) Straughan came to Texas with the Wilmeths and his uncle, Jordon O. Straughan in 1845. Jordon O. was a leader in the affairs of the new county of Collin from its organization, serving in several official capacities. R. J. Straughan married the daughter of Hi Wilmeth, the son of J. B. Wilmeth, named heretofore. Mr. Straughan died in 1926. His wife, 1935. J. F. McGarrah was born in Arkansas in 1838 and died in McKinney 1938, age l00. He and his wife, Mary Ann, are buried in the McLarry cemetery. J. F. was the son of George McGarrah, a brother of John who founded Buckner. George came to Texas in 1843, a year after his brother, and settled just south of him at Buckner. His wife died in 1934. Of the 200 or more graves in this cemetery, only some 50 are marked with stones. The rest, including 30 or 40 slaves, are indicated by bois d arc stobs, or not at all. The graveyard is still used, but only by those who already have relatives buried there. It is situated far back off traveled roads on the rim of Honey Creek valley, and few people have occasion to ever pass that way. In the course of time all these old pioneer cemeteries will be abandoned, and it seems fitting that something should now be said of those courageous settlers, their wives and their children who paved the way so that you and I can live unafraid in a peaceful land.